Before a tabular 2D or 3D plot can be drawn in a graph, its data needs to be entered into the graph's Plot Dialog property page. 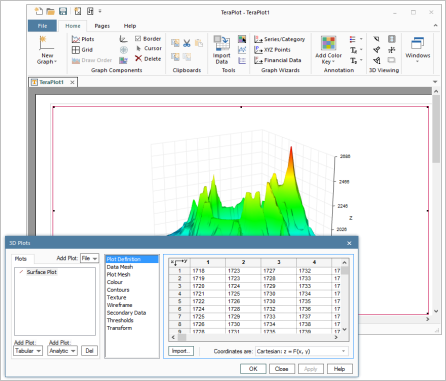 The Plot Dialog is the small dialog with the data entry table displayed over the graph on the right. The actual form the data entry table takes varies from plot to plot, but all tabular plots, in both 2D and 3D graphs, use some sort of data entry table similar to the one on the right. Data entry can then be done in various ways: by entering data into the cells manually, by pasting from Excel, or by importing or pasting from the TeraPlot Import Dialog. 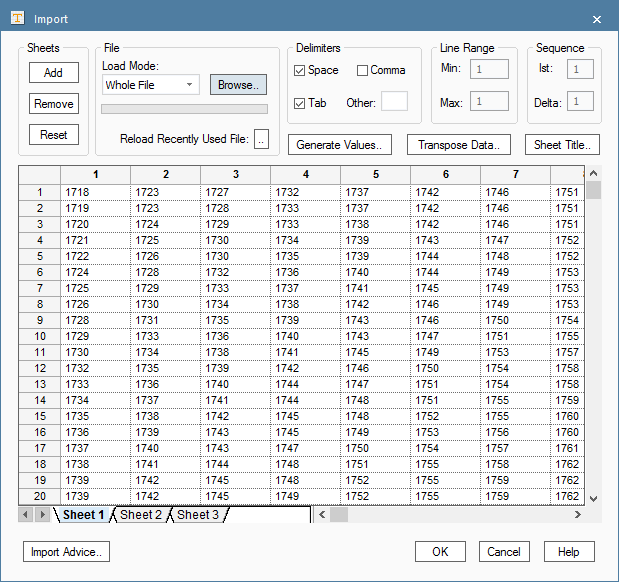 The Import Dialog (shown below) can be used to import data from text files and store it in spreadsheet form, similar to the Excel feature that allows text files to be imported to an Excel spreadsheet. 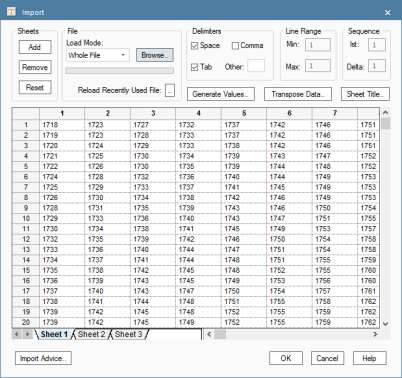 These internal TeraPlot spreadsheets can then be used as a as a common source of data across all graphs. In the figure on the right, the Plot Dialog has an Import button. 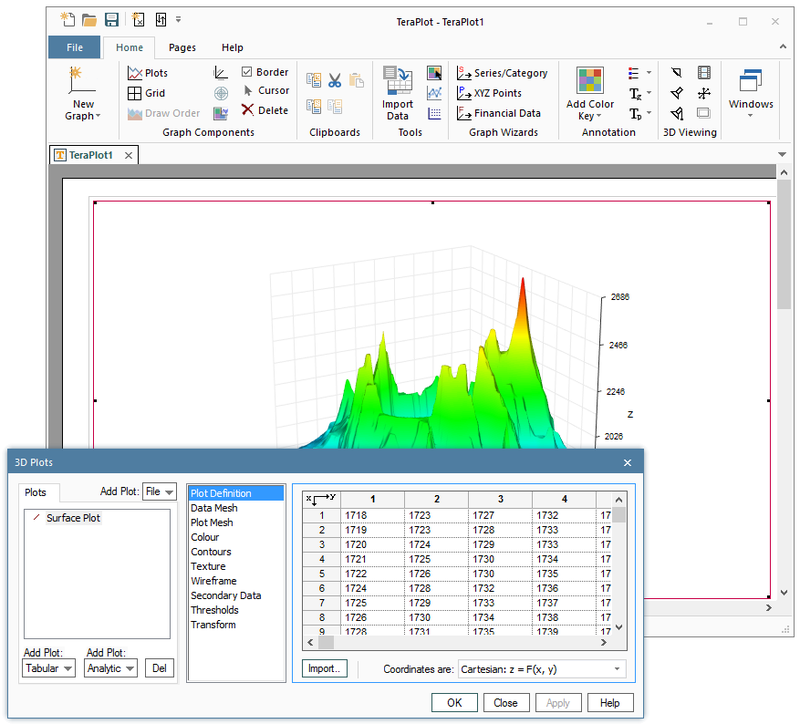 Pressing this button causes the Import Dialog to be displayed, allowing data to be transferred from an Import Dialog spreadsheet to the graph's Plot Dialog table. When Apply is pressed, the graph is updated with the new data. This functionality is common across all tabular plots, in both 2D and 3D graphs. The functionality provided by the Import Dialog is similar to the text import feature of Microsoft Excel. For example, if you have a text file, each line of which consists of a set of numbers separated by commas (the so-called delimiting characters), the Import Dialog can be used to extract the numbers only and place them in a spreadsheet. Options exist to read in only part of the file and/or use different delimiting characters. This allows more complicated situations to be catered for, e.g. extraction of numbers from a table outlined by asterisks midway through a text file. At the top of the Import Dialog is a set of controls which allow various import options to be specified, and below this is a set of spreadsheets, with specific spreadsheets accessed via tabs at the bottom. Spreadsheets can be added and deleted, and the data can be cleared from a spreadsheet. The controls at the top allow delimiting characters to be specified, and optionally the line range of the file to be read. The most commmon delimiting characters are comma, space and tab, but additional arbitrary delimiting characters, e.g. asterisk can optionally be specified. The data you import to the Import Dialog is stored in a compressed file called TeraPlot.imp, which is located in the Windows "Application Data" folder. TeraPlot graphing software loads this file when the program starts.